My two toughest critics are 3 year-old twins. “Look!” I say to the little girl, “Banana bread with chocolate chips in it!” After seeing what she did to her previous day’s lunch, I think that maybe explaining to her what it is that I’m giving her will make her more inclined to eat it. “I don’t like choc-whate chips,” she says in her best toddler voice. What 3 year-old doesn’t like chocolate chips? “You don’t like chocolate chips?” I ask, incredulously. “What do you like to eat for lunch?” I ask her. She’s distracted so it takes several times before I get anything out of her. The answer: strawberries. Since September, three times a week I go over to this family’s house and cook them dinner in their beautiful kitchen and pack lunches for their 3 year-old twins to take to school. 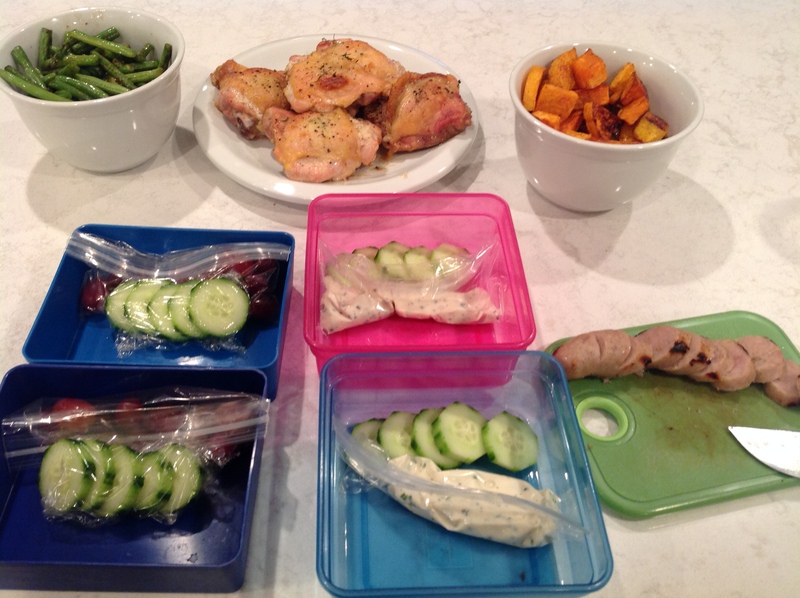 Sometimes I see the lunchboxes when they come home from school with the remainder of the day’s food smooshed and soft in the containers. Other times I have no idea. After talking to their mom about what they might like and perusing a picky eaters’ book that she tossed my way, I thought I’d try a few new things. So I made homemade chicken nuggets, which I thought they would love, and I threw in some ketchup for dipping and a treat of homemade chocolate chip banana bread. I had made banana bread the week before with some browning bananas and (apparently) the kids had loved it. 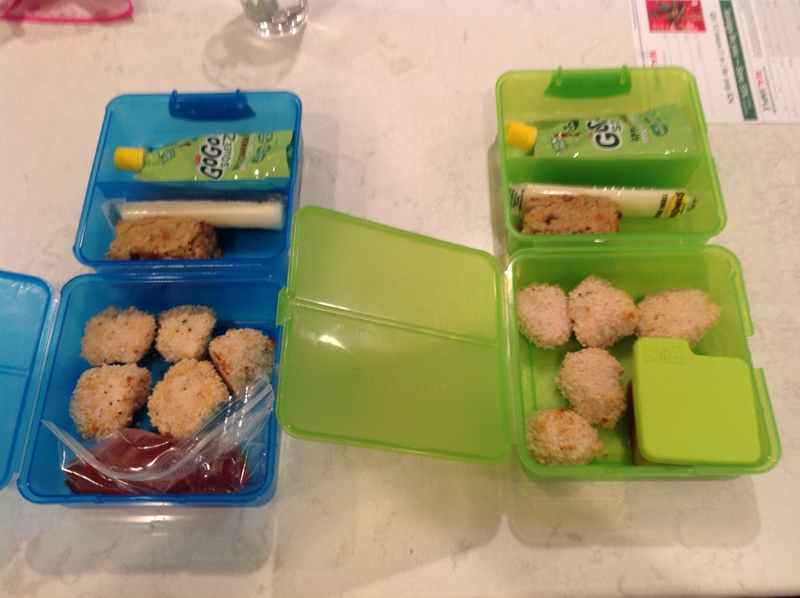 On chicken nugget day, the little boy forgot to bring home his lunchbox and his sister hardly ate. Not a nugget was touched, nor the string cheese, and the chocolate chip banana bread (before I found out that she doesn’t like chocolate chips) had been dunked into the ketchup. I tried not to be personally insulted. They are little kids anyway. Dinner in the background. A new lunch attempt in front. 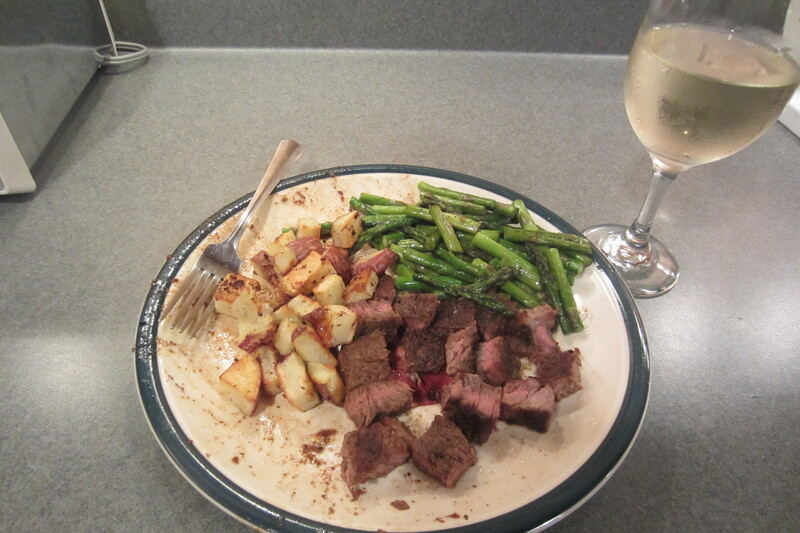 Luckily the parents have been more than pleased with my cooking. The mother will walk by while I’m making lunch and say “Oh doesn’t that look good?” or “Mmm smells good in here.” And the father expresses equal gratitude when he comes home from work. Kids will be kids – I guess I’ll have to work on them. I have begun to adjust to the longer days and sometimes still even have the energy to cook more when I come home (sometimes). During Angie and Dave’s Fat and Happy Tour, Dave told me about this wonderful roast chicken recipe he had made that was fast, easy, and delicious so (despite not really having the actual recipe) I decided to make it last night. 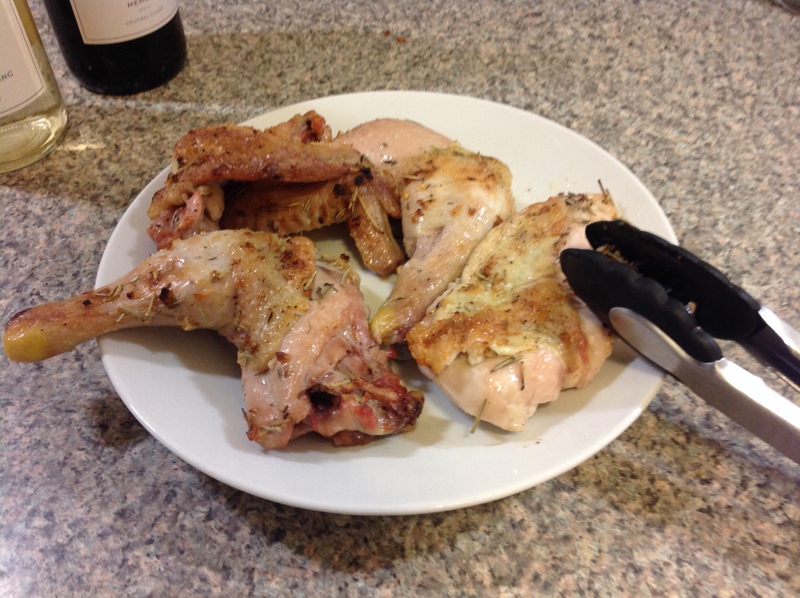 While my chicken butchering skills could definitely use some refining, the chicken turned out delicious. Moist and flavorful and surrounded by veggies soaking in chicken juices, it is definitely a good one-pan chicken to have up my sleeve. Next time I’ll watch the video on how to cut up a whole chicken before I cut up the whole chicken. Makes sense. 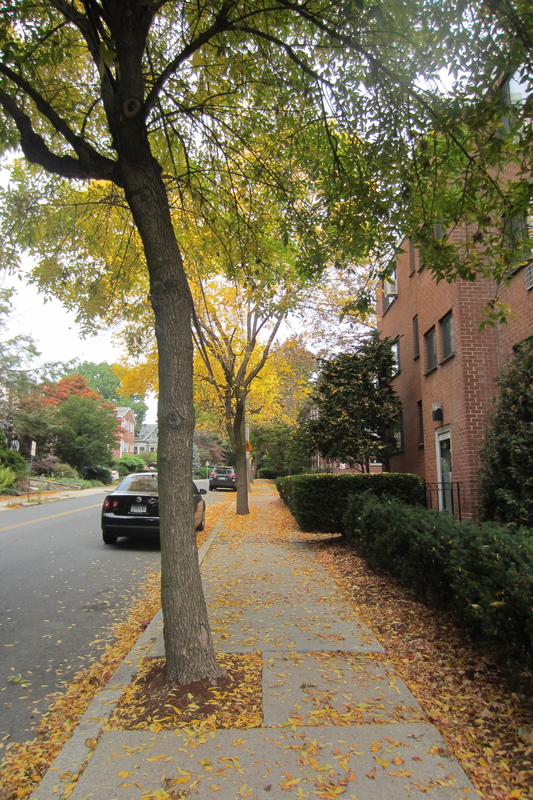 I hope you are all enjoying the beautiful fall days as much as I am. 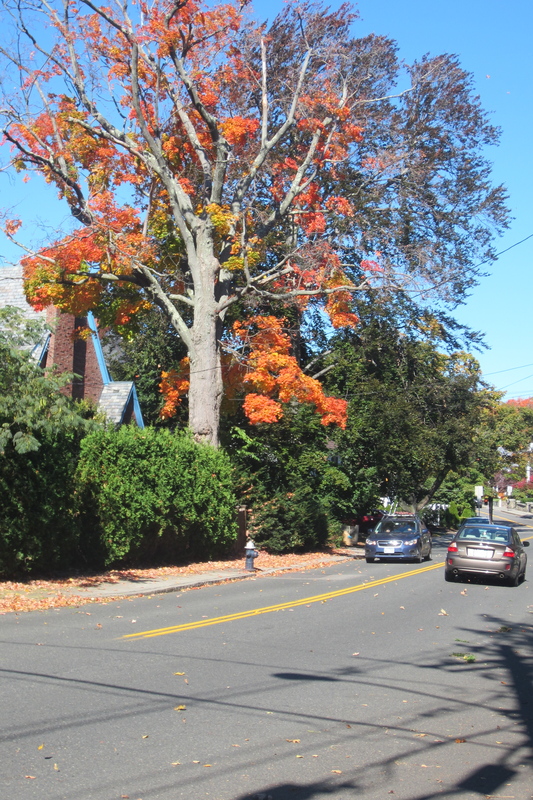 When I am not cooking I am biking back and forth to work (thank goodness for some exercise with all that eating I do) and marveling at the vibrant hues that nature produces. We pull up to downtown Hartford in the Greyhound bus and are quickly whisked off by one four-legged, black, furry friend, and my aunt Angie and her boyfriend Dave. First stop: Jamaica. Well, Jamaican food at least. We pull into the parking lot lining a short strip of stores and duck into this small Jamaica take-out place Dave’s friend has been raving about to grab lunch. We picnic on the beautiful, quiet lawn of UConn’s law school and then hit the road to begin our trip. After a beautiful drive through the crimson tree-lined Connecticut roads, we make a quick stop at Nodine’s Smokehouse to buy some bacon and check out their smoked turkey for Thanksgiving. Their selection of bacon is impressive and the taste is unrivaled. We each enjoy a few thick and meaty slices with our blueberry buckwheat pancakes the next morning. 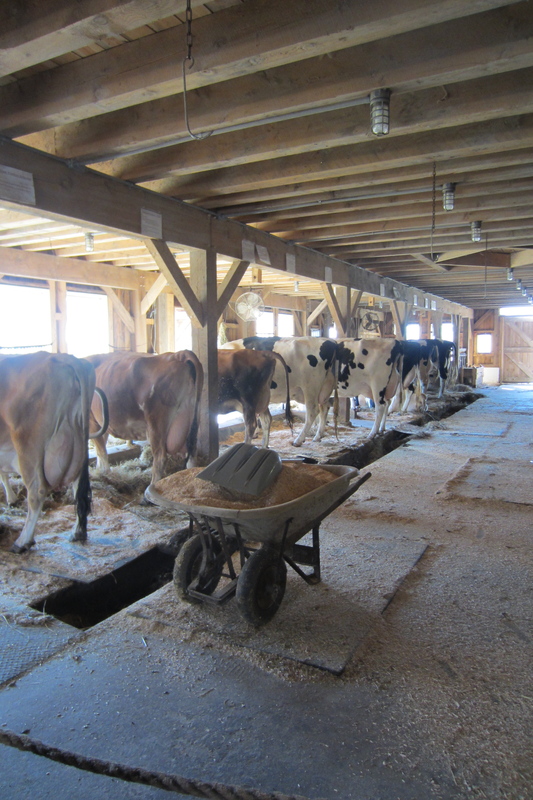 A short drive later we pull into Thorncrest Farm – a dairy farm with a freshly built barn only a few years old. 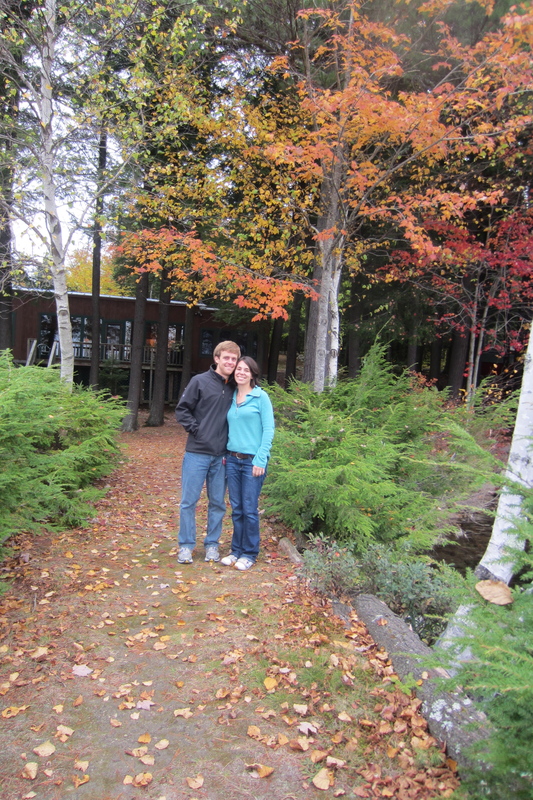 Dave and Angie introduce us to the owners, Clint and his wife Kim, two of the loveliest people you’ll ever meet. 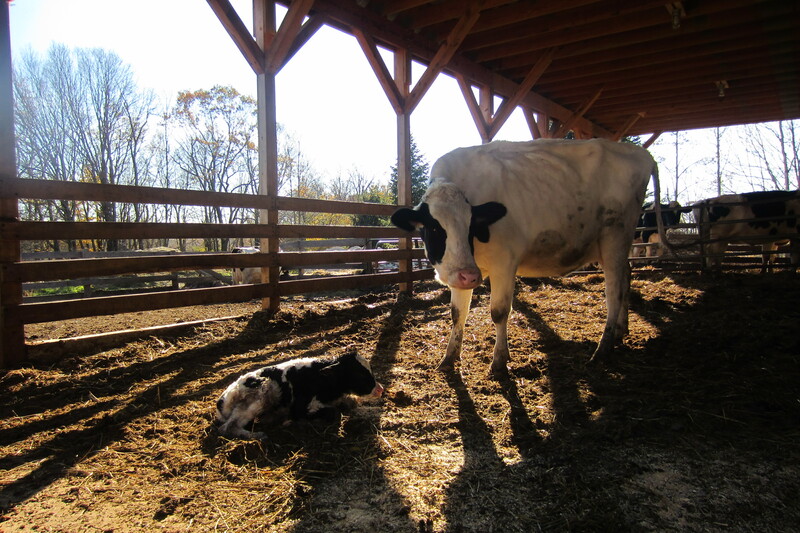 A half hour old calf lays on the ground beneath her mother’s legs as we watch in awe as she struggles to stand. What miracle of life that animals mature so much quicker than humans! In a year or two she’ll be having her own calf. We meet Kim in her chocolate shop – Milk House Chocolates – which she started just under a year ago after teaching herself how to make homemade chocolates using her cows’ own milk. 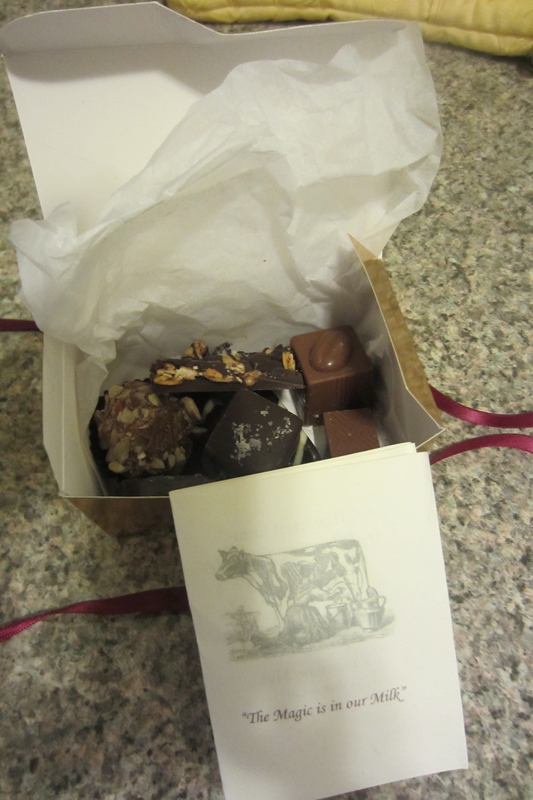 Kim lets us sample the chocolates and tells us her story – how she sometimes finds inspiration in the middle of the night and has to test out her idea or how she tried using both Jersey milk and Holstein milk in different chocolates to get just the right flavor. 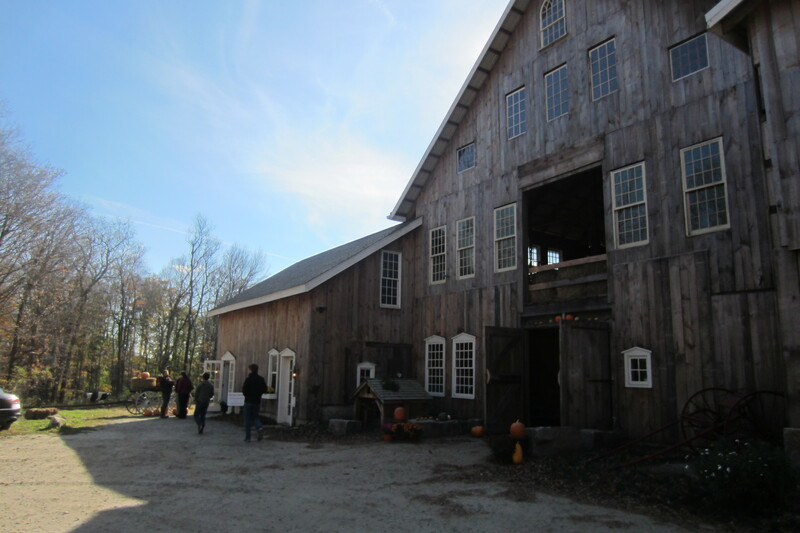 After an amicable chat with Clint and Kim, we buy a few boxes of chocolate, see the barn, and head out. Turns out they sell some of their milk to Cabot to make their cheese! The next stop: The Dutch Epicure Shoppe – an old fashioned store selling Dutch and European products, cured deli meats, cheeses, and homemade goodies like the mocha mouse (Dave’s personal favorite, which he kindly shared with us). 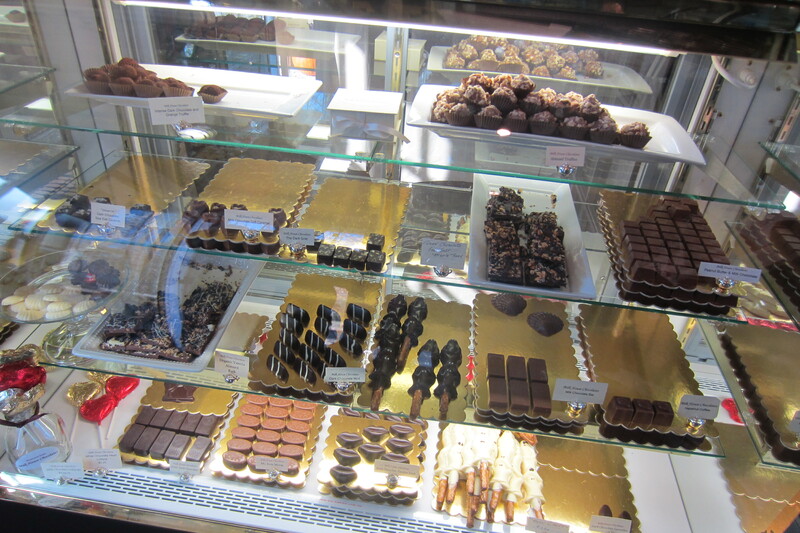 We buy a few cheeses, a mocha mouse, and head to our next stop – Arethusa ice cream. 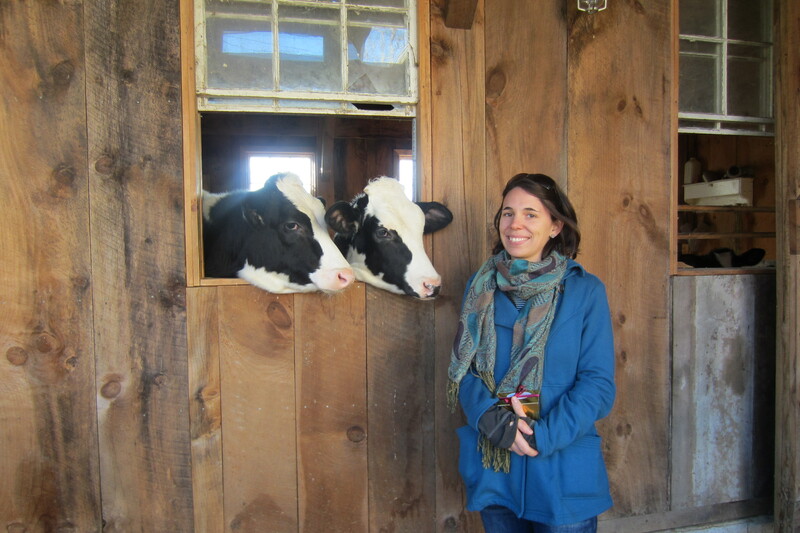 Started by two Manolo Blahnik executives (designer shoe company for those who don’t know) Arethusa is a pasture-raised dairy farm that now sells all of their dairy products in their ice cream shop. They believe in making milk and ice cream “like they used to taste,” in other words, without any unnecessary added ingredients. We sample some cheeses they had out (delicious!) as well as their ice cream (of course) and take some butter and cheese with us. We even run into the owners on our way out – who say “hey” like we are old friends! Who knew this tour involved celebrities! After our brief encounter with stardom, we head back to Dave and Angie’s to rest and find some dinner, well stocked with meat, cheese, and desserts (Dave and Angie were smart enough to bring a cooler to keep everything cool and out of reach from Jackson, the dog’s, hungry snout). 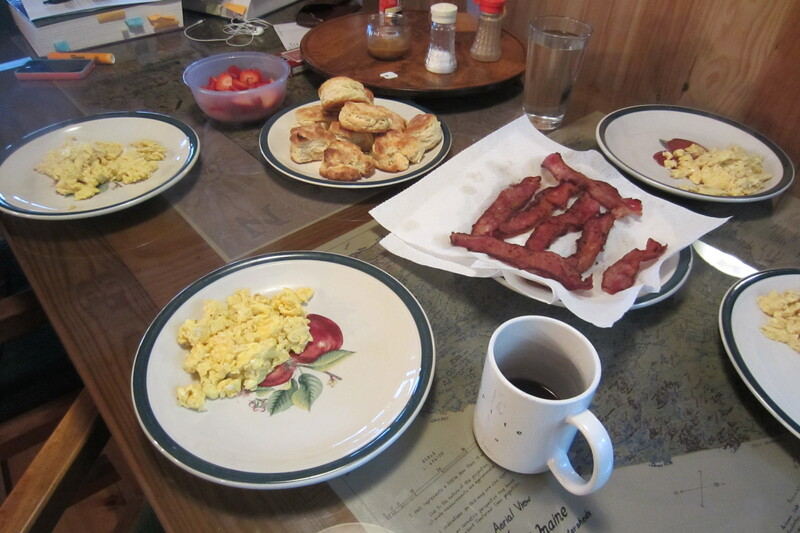 We dubbed the tour Dave and Angie’s Fat and Happy Tour thanks to all of the goodies we indulged in. 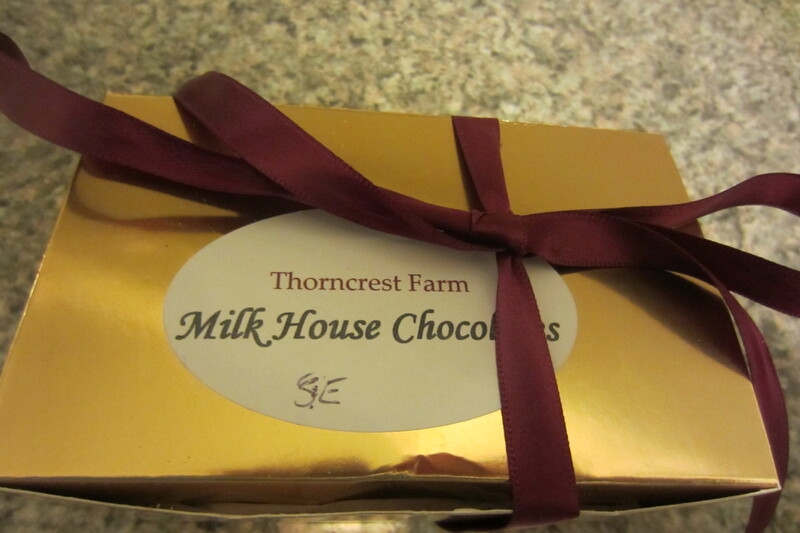 And thanks to Angie’s reminder, we remembered to take some of Kim’s delicious chocolates back to Boston with us. My personal favorites were the sea salt caramel and the almond truffle, though the chocolate mint made with fresh mint from Kim’s garden has an amazing fresh mint taste that you don’t usually find in chocolates. When we left Sunday afternoon, Angie asked when we’d be back again. Unfortunately, not until Thanksgiving, though now there are plenty of reasons to go back sooner. 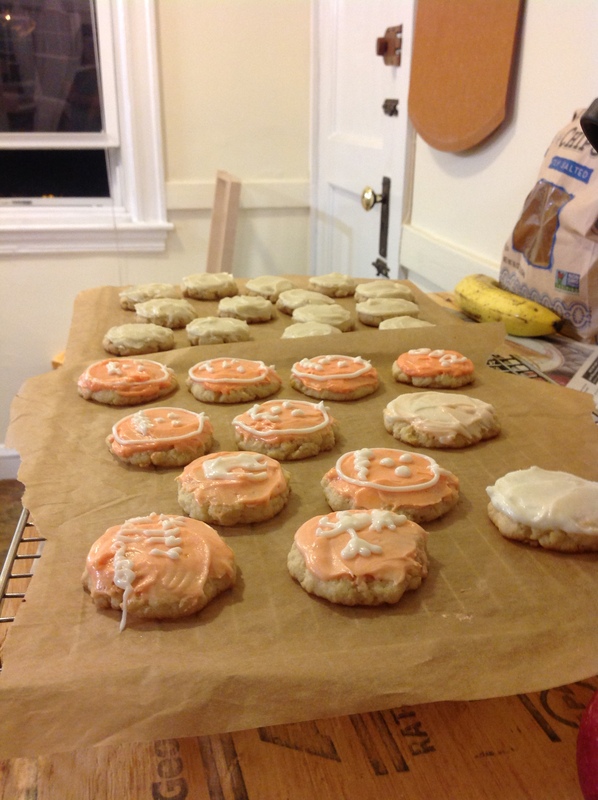 Post 53 – Happy Food Day! For those of you who don’t know today is Food Day! 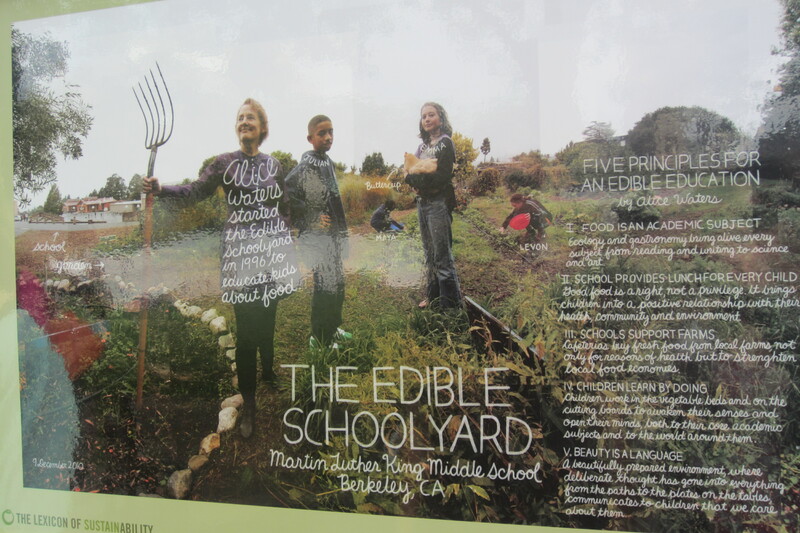 Started by the Center for Science in the Public Interest, this is Food Day’s third year running. The CSPI uses Food Day as a way to celebrate good food and promote conversations around food issues from sustainability to food justice and affordability. Though I started out the day nervous and unsure, by the time my first panelists began to arrive I felt a surge of adrenaline and excitement run through me, and suddenly the panel began and ended before I knew it. I came away inspired by the community that I work for and happy to have had the opportunity to host such an event. I was impressed by the students’ questions, the panelists’ well-crafted responses, and the kindness of teachers and faculty who congratulated me on the event after it ended. Though one of my co-workers joked that we’d have to make the door wider to account for my big head, I appreciated all of the compliments I received and felt honored by people’s response to my event. In addition to hosting a great event, we also served a delicious meal with fresh local fish (delivered this morning)! With this local pollock we made magnificent (if I do say so myself) fish tacos with pickled red onions, cabbage, salsa, black beans, and crema (sour cream mixed with mayo and lime juice) and everyone quite enjoyed it. I am glad that tomorrow is Friday, but I can definitely say it’s been a great week. Life is good. So good. Busy, but good. Columbus Day weekend we took a trip up to Maine with our good friends and enjoyed the beautiful colors and the relaxed, quiet setting. We played cards, drank wine, and ate more guacamole than we thought we could and when the weekend was done, all were sad to return to our normal lives. When we weren’t in Maine, Sam and I have been enjoying Northeastern soccer games on the weekends and evenings since their field is right across the street from our apartment. On the nights we don’t go, we hear the announcer’s distinctive voice calling the players off the side lines and we see the bright lights blaring into our living room (more so now that the leaves have fallen off the trees that blocked our windows). Though life has been busy, I can’t complain. Life is full, fragrant, and colorful. I am grateful for all the good times. The only sadness is that as we fall farther into autumn, it gets colder and darker. Winter is coming. Almost time to break out the stews and homemade breads. Until then, it’s pumpkin season. Happy Fall. Happy Food Day! It’s been two months. Two months that I’ve been looking at this vial of purple and gold crystals wondering what to do with it. I broke the stickered seal just to smell it and look at it, but I didn’t dare use it until I knew how. The small vial was too precious. 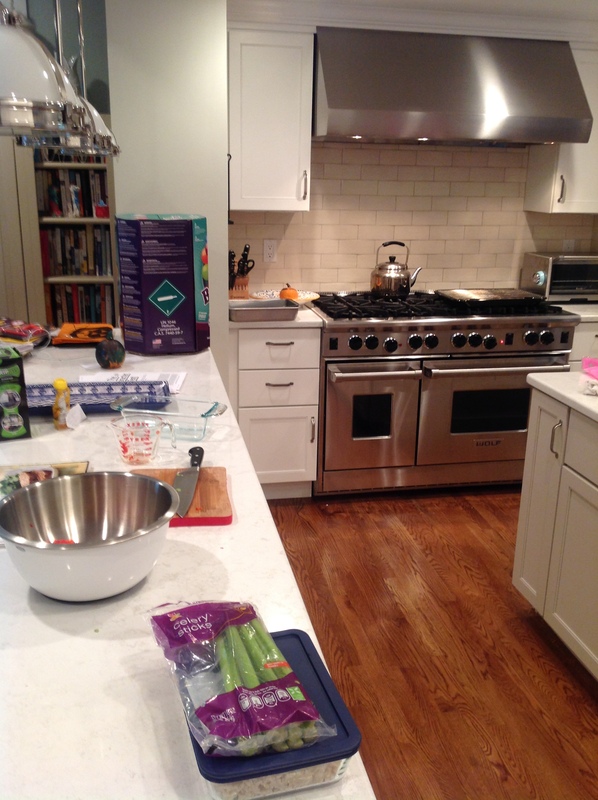 I haven’t exactly been looking for recipes to use it, but it has been on my counter (and on my mind) all along, patiently waiting for me to make a move. 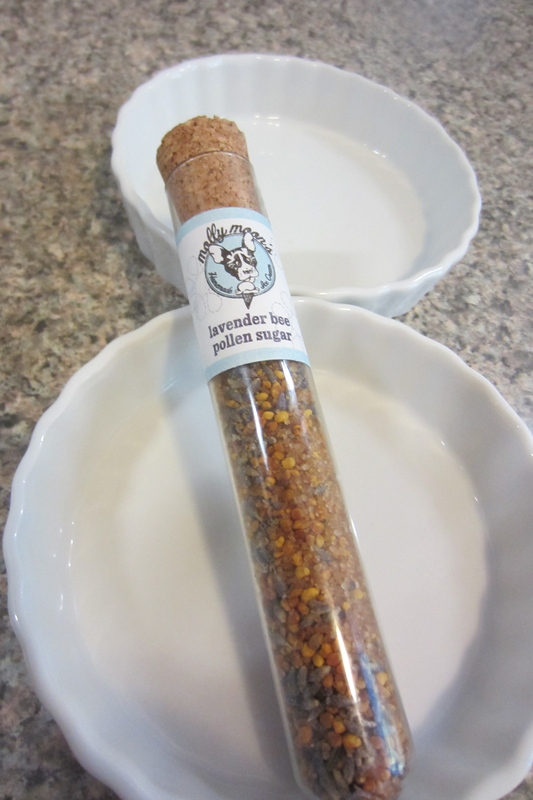 I got this lovely lavender bee pollen sugar from R, my future sister-in-law, when she and Sam’s brother came to visit back in August. She knows of my love for unusual (challenging) ingredients and so she brought me this treat from Seattle’s Molly Moon’s. I thought about rolling sugar cookies in it, bejeweling their rims with colored crystals, but I didn’t want the lavender to leave black teardrops around the cookies as it burned in the oven. 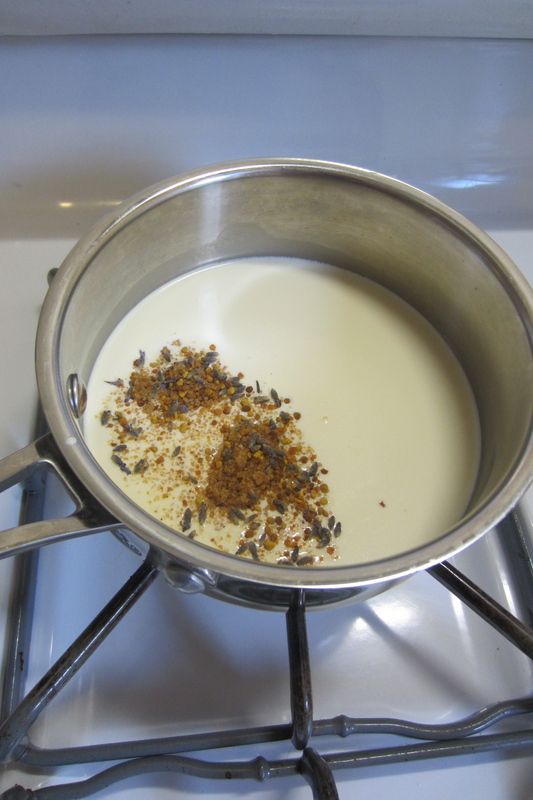 Then I found a recipe for Lavender and Honey Crème Brulee where the lavender steeps in the cream just long enough to perfume it before being strained. 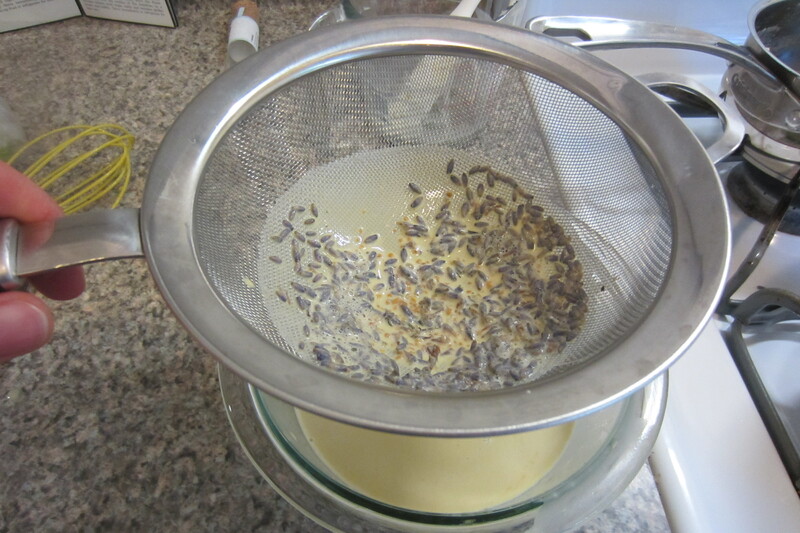 The temperature is kept relatively low while the ramekins cook in their warm little water bath, making it possible to leave the lavender in without fear of burning, if you desire to do so. 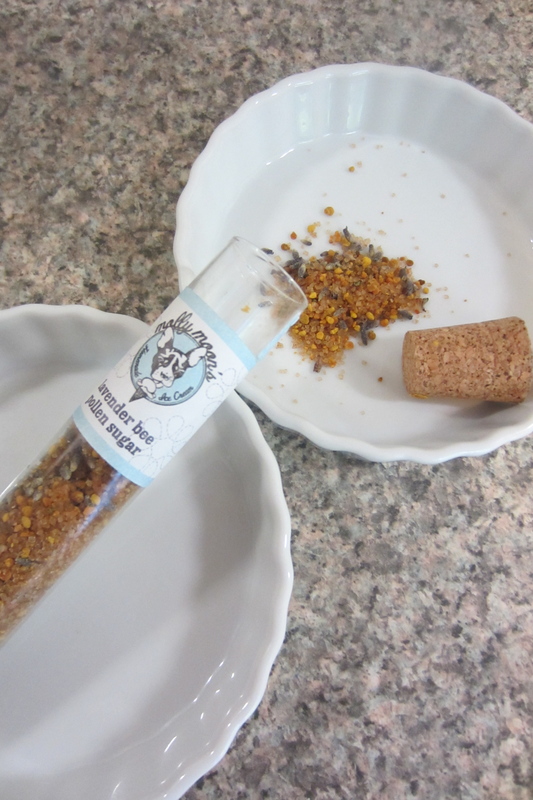 This wonderful little sugar contains the lavender and the honey already so it makes a perfect fit for this recipe. I just added a little more honey for an extra boost. 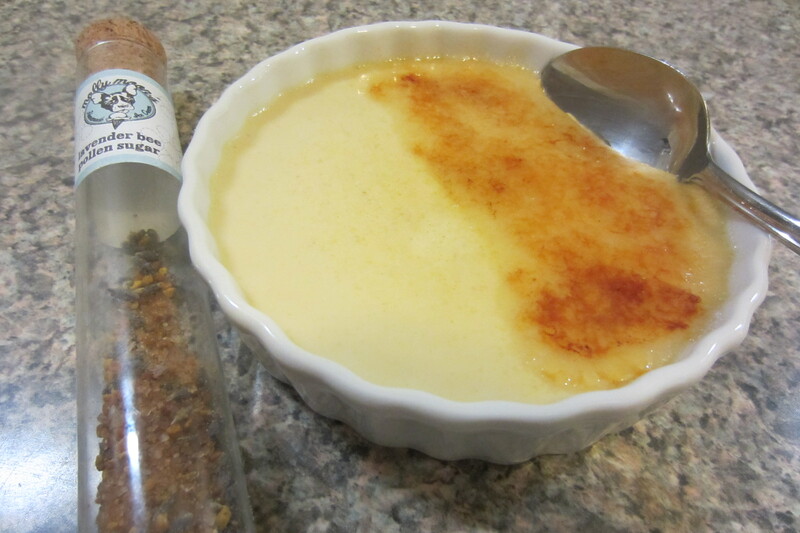 Using my standard creme brulee recipe and this one for inspiration, I went for it. I only wish dear R could have been here to sample the results. Next time we’re both in Seattle I’ll have to make some more. As a note, don’t be intimidated by crème brulée! It’s all about slow and steady, calm and gentle (until the blow torch comes out. Then you should still probably be gentle. You’re playing with fire afterall!) 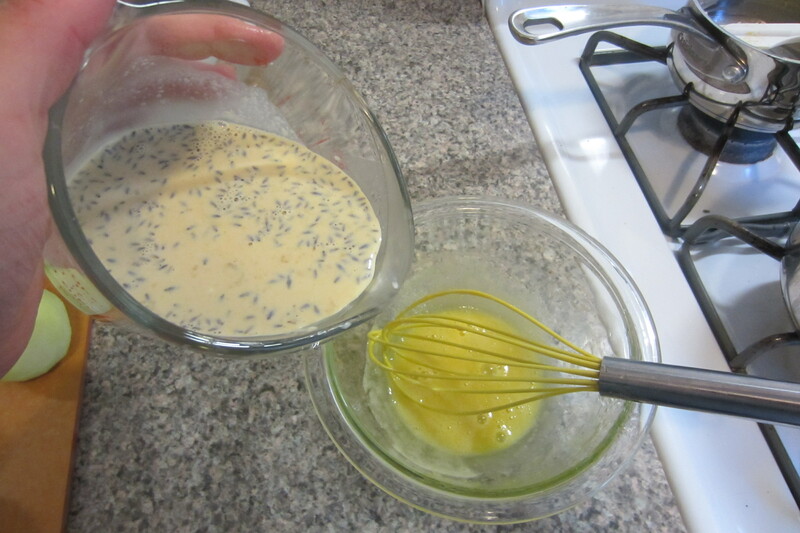 Of course if you don’t have a blow torch, just eat these cooled as a custard. 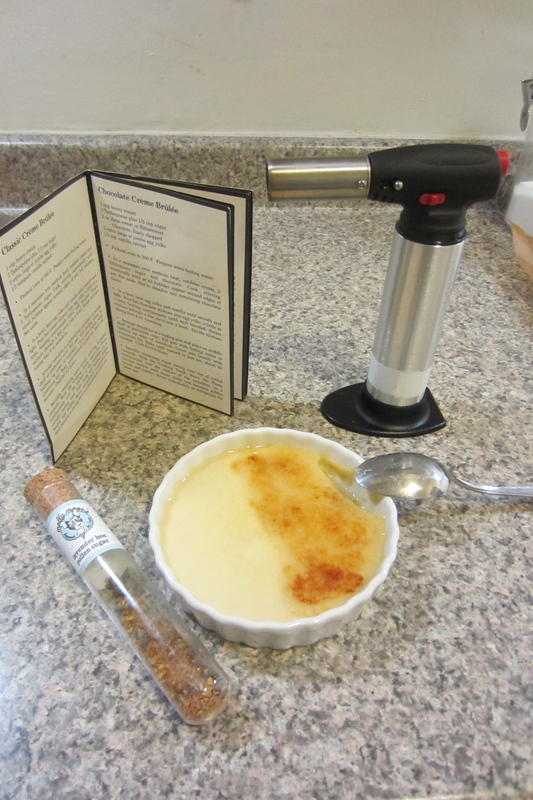 OR do as I did with my first crème brulée and call your neighbor with the woodshop-sized blow torch and torch away. Good luck! Boil a quart of water and set aside. Preheat oven to 300 degrees. 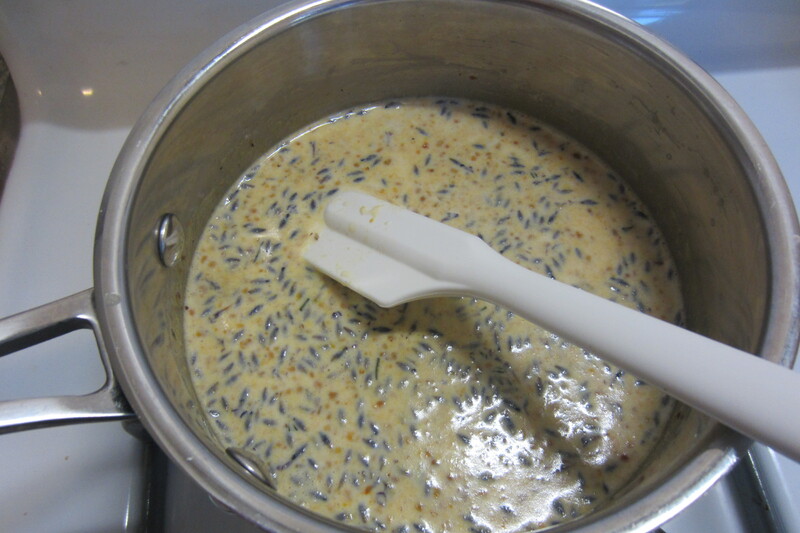 In a small saucepan heat the cream and lavender bee pollen sugar on low heat, stirring to melt the sugar. Heat just until the cream starts to get bubbles around the edges. 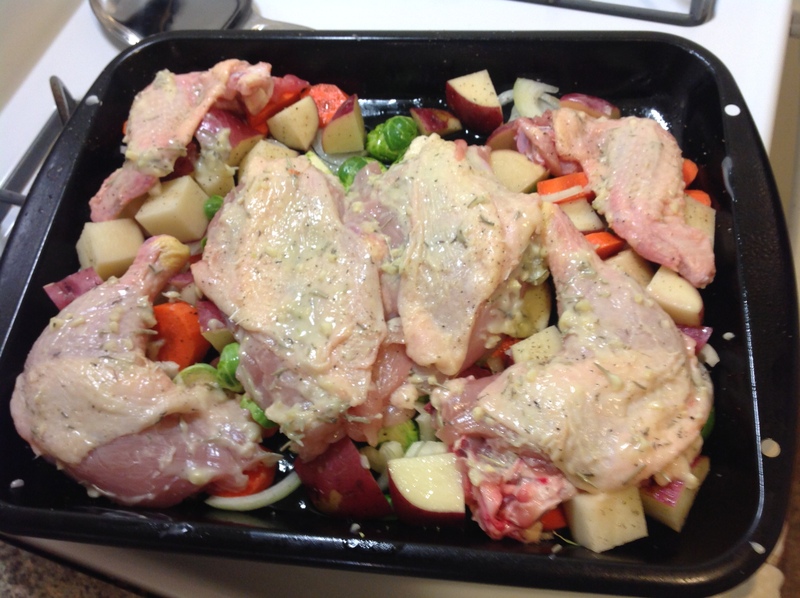 Remove from heat and let steep for 10-15 minutes. 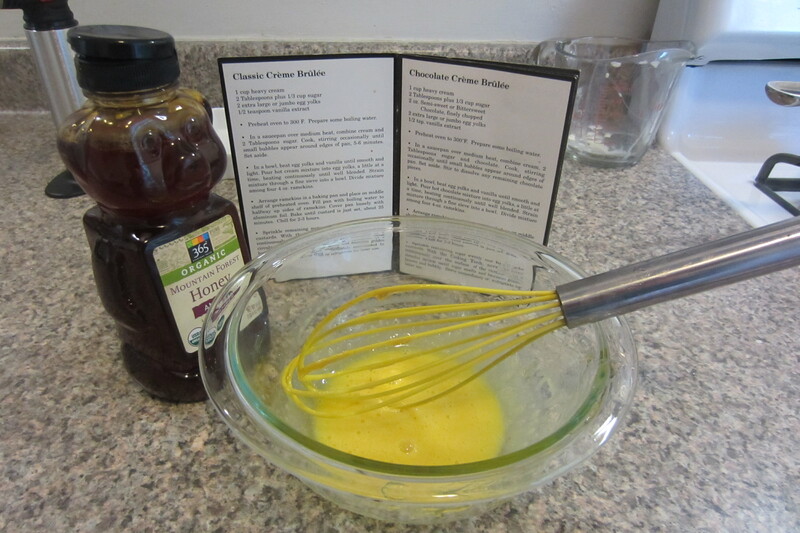 In medium bowl whisk egg yolks and honey until smooth. 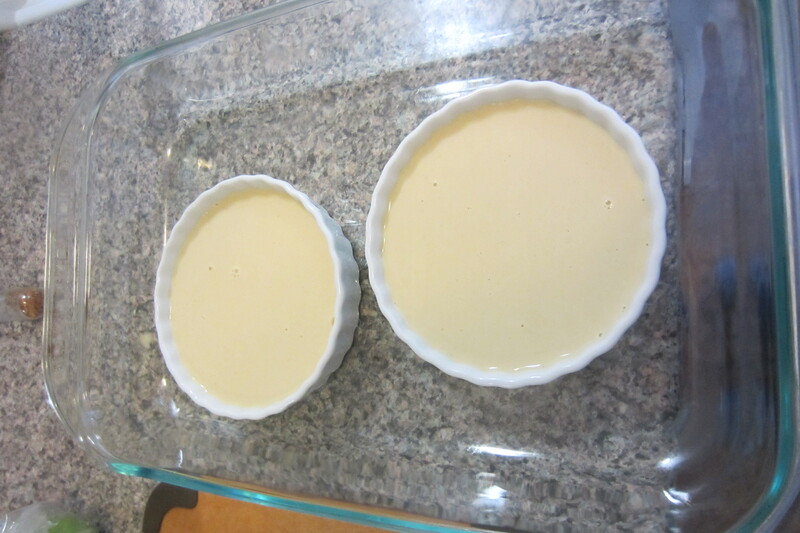 Arrange 2 large ramekins in an oven-proof dish and divide the cream mixture between the two, being sure not to fill them too close to the top. Carefully pour the boiling water around the ramekins until it comes up about halfway up the sides of the ramekins. Cover the whole pan with foil and gently transfer the pan to the oven (don’t splash water in the ramekins!) Close the door and set the timer to 20 minutes. Check them after 20 minutes though they may need 5 minutes more. They should jiggle slightly. Carefully remove from oven, remove the foil and let cool just long enough to remove the ramekins from the hot water bath. Cool in the fridge for at least 2 hours. Top with sugar and torch with a blow torch if you have one. Sam and I shared this one. I liked the non-torched side because it stayed colder, but he liked the warm custard. Share with a friend if you like or just enjoy by yourself! Let’s talk about the science of cooking hamburgers and why you should drink more wine. Let’s talk about sustainability, agriculture, raising chickens in your own backyard, and grinding your own hamburgers. Let’s talk about FOOD, but more than just gourmet restaurants and molecular gastronomy. Let’s talk about what makes a food desert, why people are hungry, and why restaurant workers are not paid minimum wage. 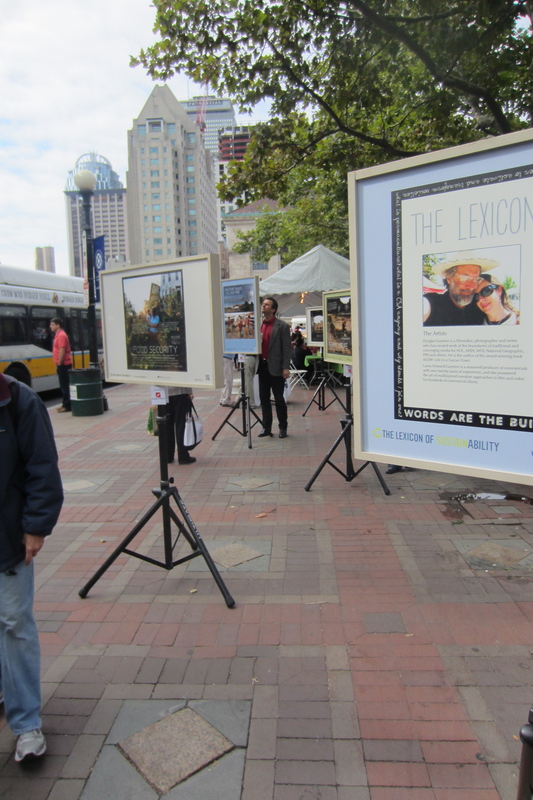 We learned about all of these topics this weekend at the Let’s Talk About Food Festival in Copley Square. With perfect weather to motivate us to head outdoors, Sam and I went into the city to see the demonstrations, booths, and exhibits on display for the day. Though the turnout was smaller than I expected, the event addressed some wonderful topics. Best of all the information was free and accessible to anyone walking by. 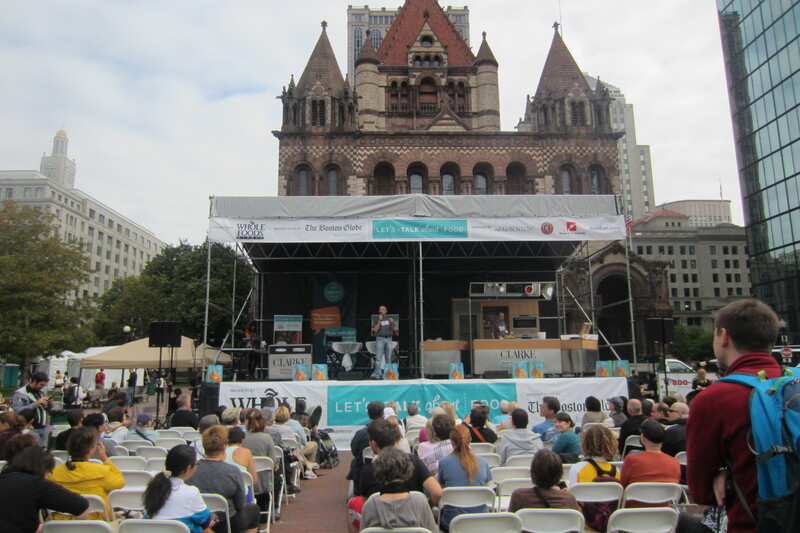 In front of the beautiful old Trinity Church, the organizers set up a main stage where chefs, nutritionists, geeky cooks, and restaurant owners alike displayed their talents and divulged their nutrition tips and cooking secrets. There were demos throughout the day in addition to the informational booths that you could visit at anytime. 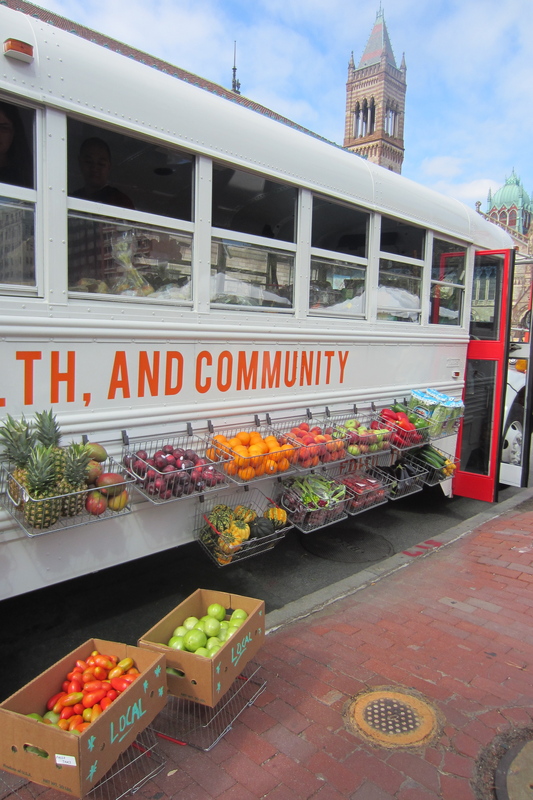 A few food trucks lined the streets, including my favorite, Bon Me, and a new truck called The Fresh Truck whose motto reads, “Driving food, health, and community.” Like a produce market on wheels, this converted school bus drives to Boston neighborhoods to offer affordable and healthy food options to those who lack such a market nearby. Though we weren’t brave enough to engage in conversation at the Endless Table sponsored by the Museum of Science, there was definitely the opportunity to literally talk about food. I saw strangers gathering round tables, shaking hands, and exchanging words with the hope of making a change. 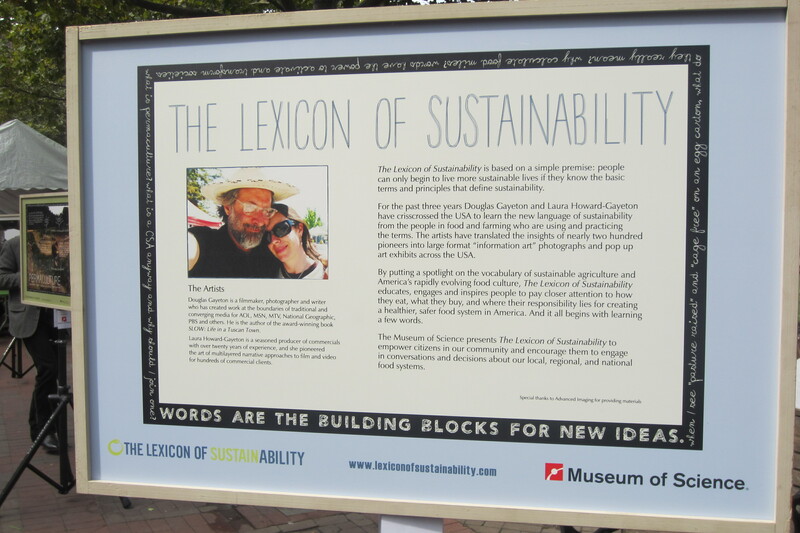 The Lexicon of Sustainability exhibit gave pictures and meaning to many food terms thrown around that very few of us understand. 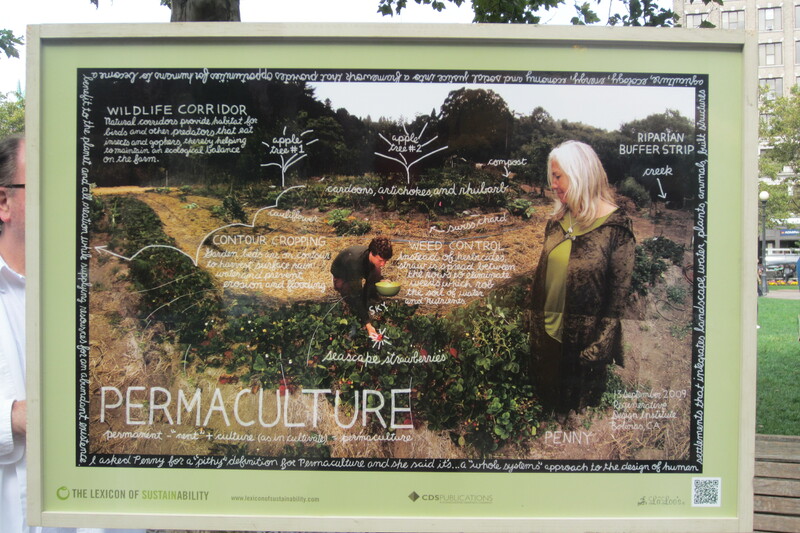 Like Permaculture (which I still can’t explain very well). 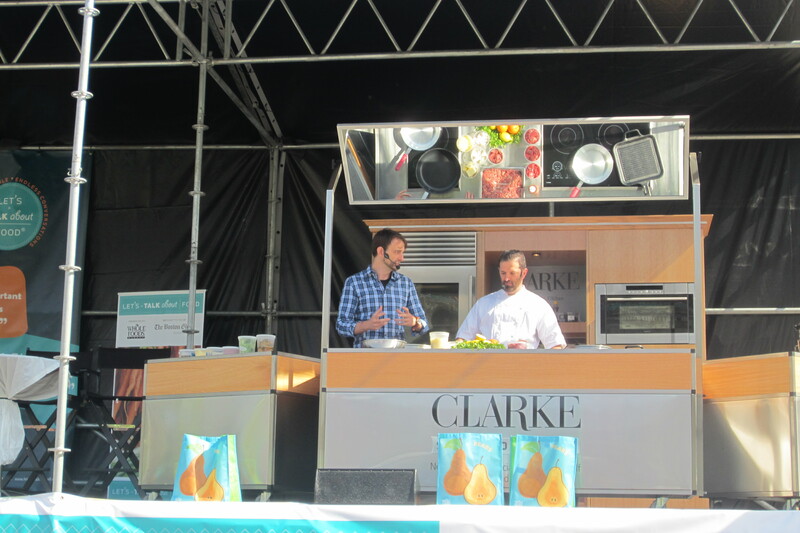 And if all your questions weren’t answered you could head over to the Ask a Chef or Ask a Nutritionist booth and have them field your questions. As the on-stage demos lost our interest, we took advantage of the beautiful weather and wandered over to the Public Gah-den. The blue skies and summer temperatures had attracted several others including two brides and their grooms. We also saw a bride and groom in-the-making as one man got down on his knee to propose to his love, while their friends waited excitedly below the bridge clutching a bundle of balloons. 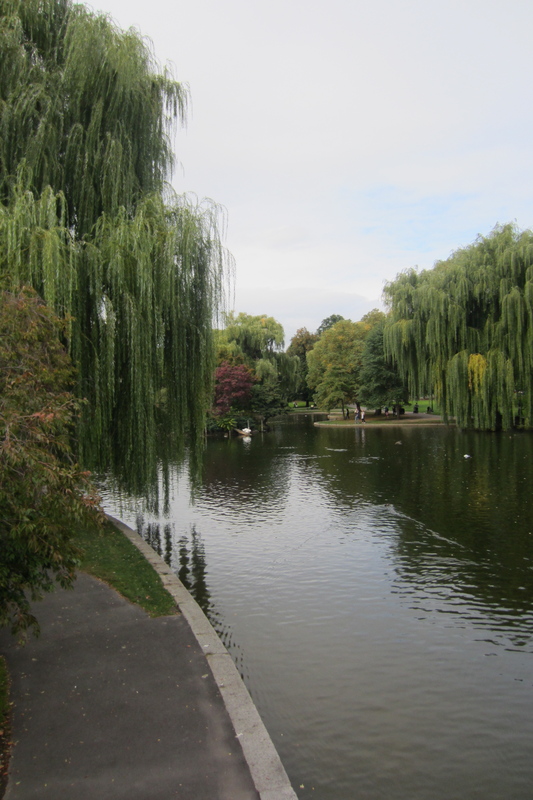 All in all it was a beautiful day (despite my crackling voice and stuffed up nose) and I felt energized and excited to be part of the food world in Boston. 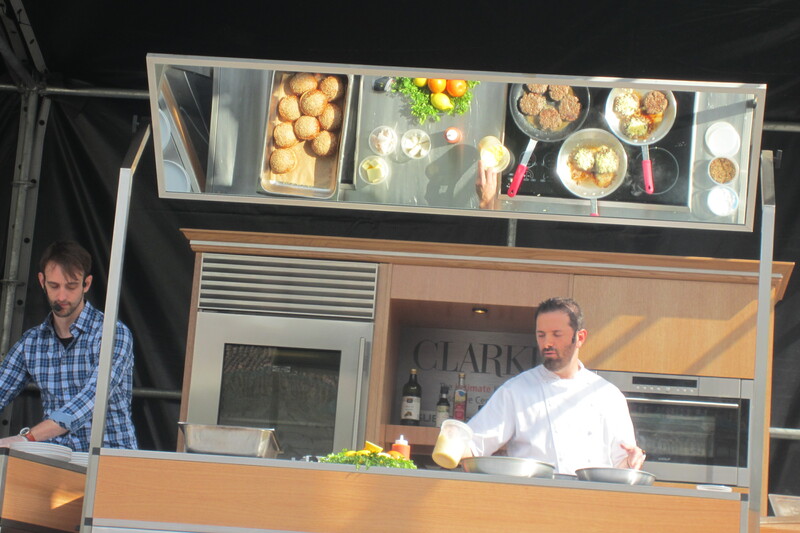 I saw many people I knew and I even recognized many of Boston’s famous chefs by their faces. Boston is a great city to talk about food and I love the conversations that have begun in the last few years. 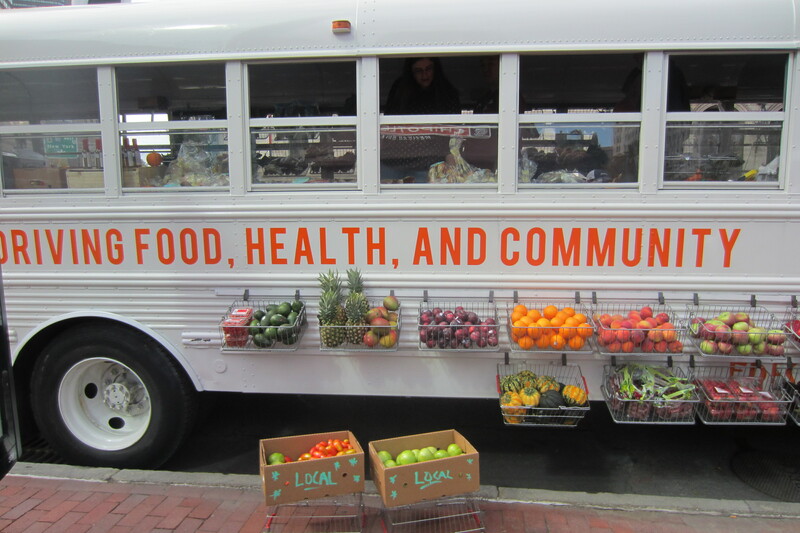 Food trucks have popped up to meet the mobile crowds, many farmers’ markets now accept SNAP (food stamps), and people have begun to talk about why food matters to everyone. It’s a conversation that has only just begun (and that I have only very briefly touched on here) and I look forward to hearing more. This October 24, 2013 will be Food Day, and with it, I hope, a chance to celebrate food and educate ourselves on all things food-related. I look forward to sharing more with you in a few weeks. It sure feels like fall around here. 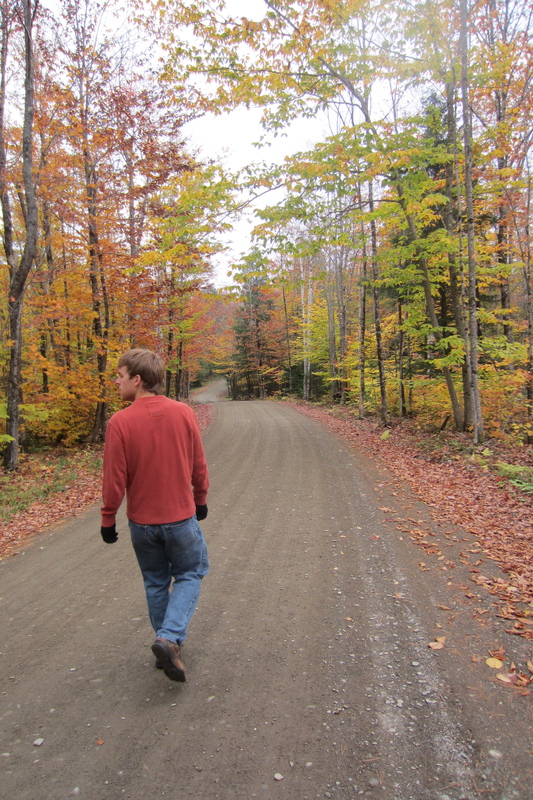 Cooler temperatures, beautiful fallen leaves, and applesauce. I have some bad news. The applesauce is all gone. In one short week (5 days technically!) Sam demolished that giant bowl of homemade applesauce that I assured you would not make it to the freezer. I think I had a small bowl or two. 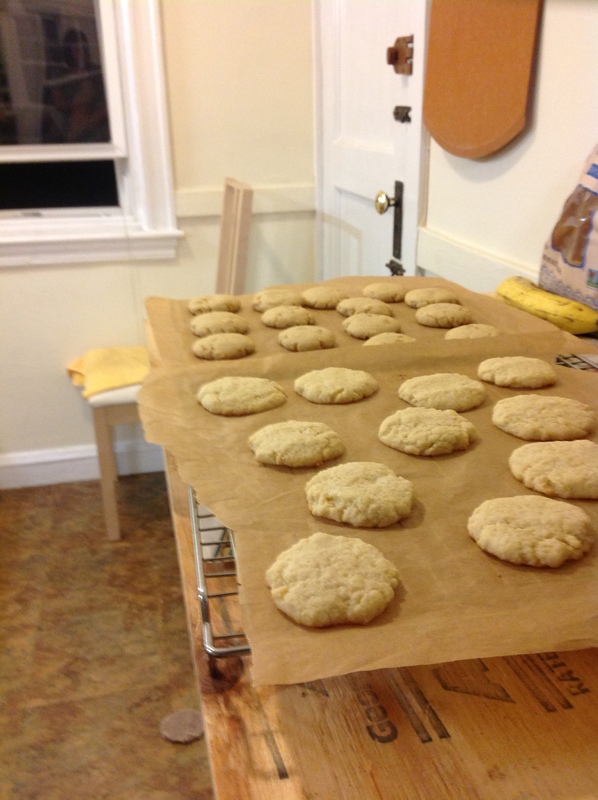 The good news: that wonderful guy is in the kitchen (as I type) making another batch, completely without me asking him to! With this final batch of applesauce no more apples remain from our wonderful apple-picking trip. (I think maybe it’s time to go again?) 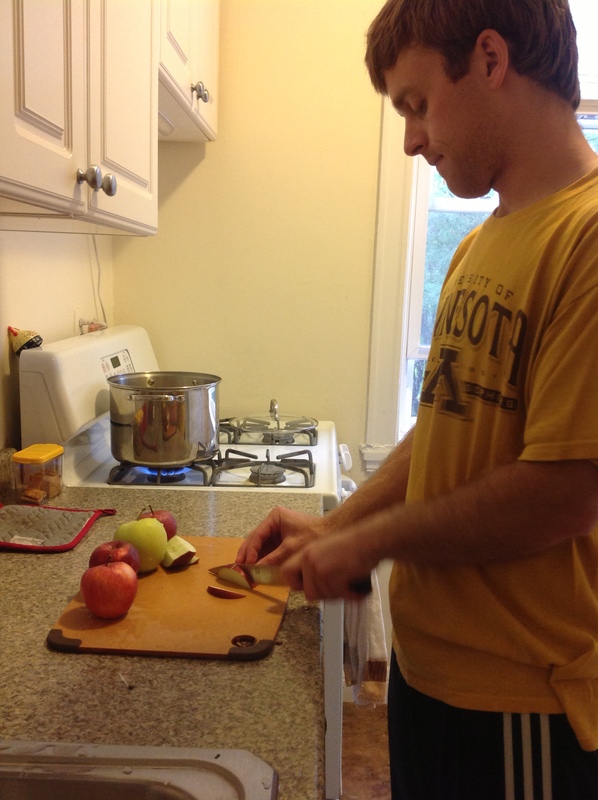 I had thought that, with 40 pounds of apples, surely I would have a million and one recipes to try in order to use up the delicious fruit gems, but, alas, many of the recipes never made it to the test kitchen. 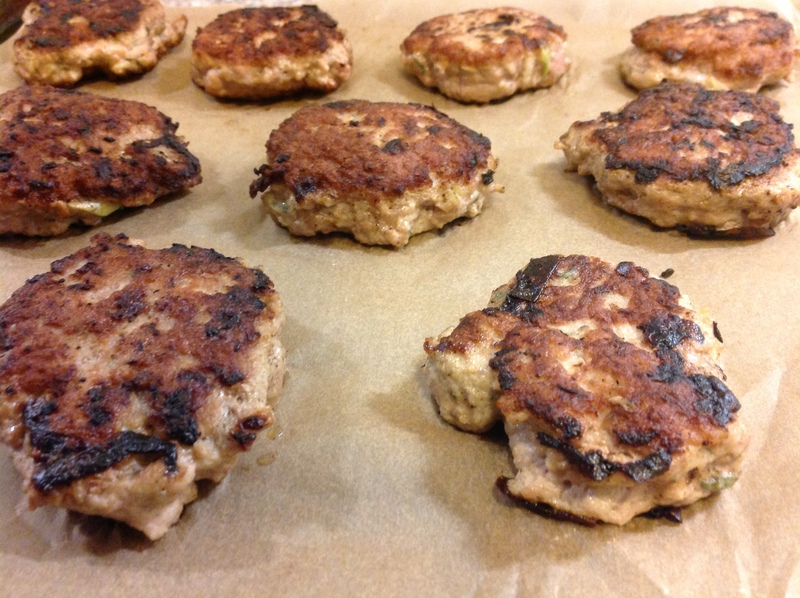 I did, however, try one recipe that has become a part of my breakfast a few days a week: turkey and apple breakfast sausage. After searching a few recipes online I put the best of them together to make my very own. They turned out moist, flavorful, and very filling. They use very little apple, but the apple adds nice flavor. Though I shredded my apple unpeeled, next time I think I would peel the apple as the skin seems to burn easier when cooking the sausage. 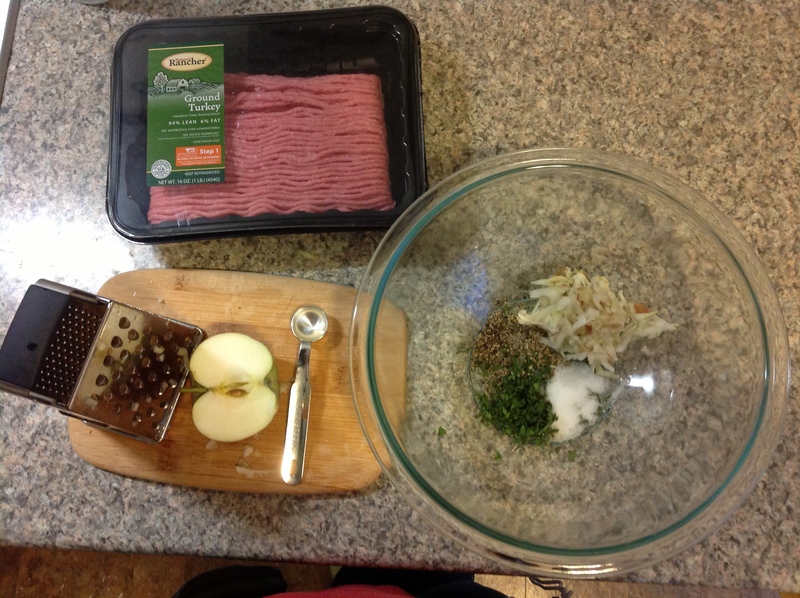 Combine all of the ingredients in a bowl with your hands and gently form into patties. 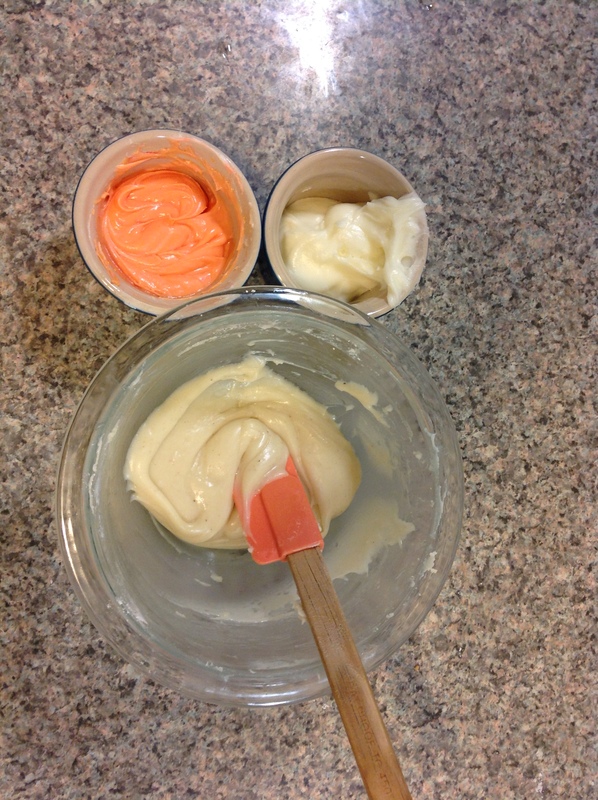 I used a lightly scooped 1/4 cup measuring cup to make mine. You can refrigerate to allow the flavors to come together or you can cook them now (I did the latter). 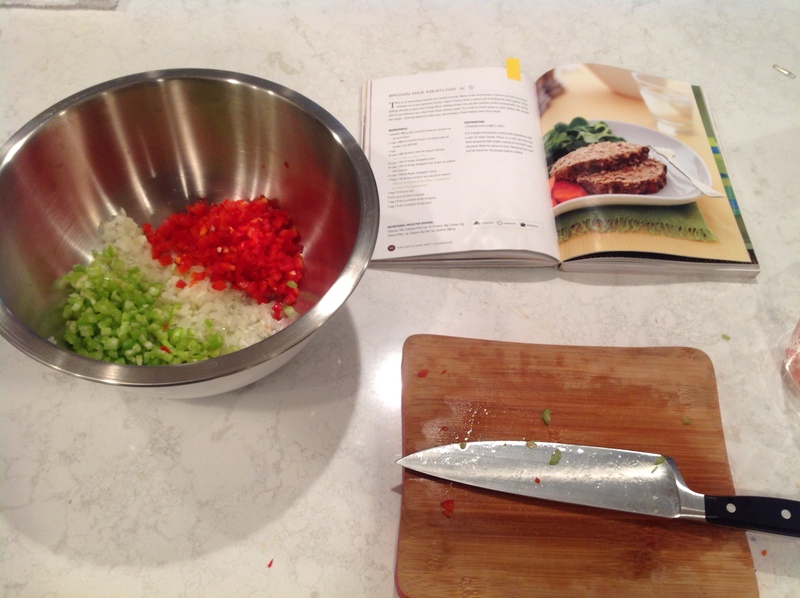 The seasonings are flexible and totally up to you, so feel free to adjust as needed. Heat a large non-stick skillet over medium heat and lightly drizzle with oil. 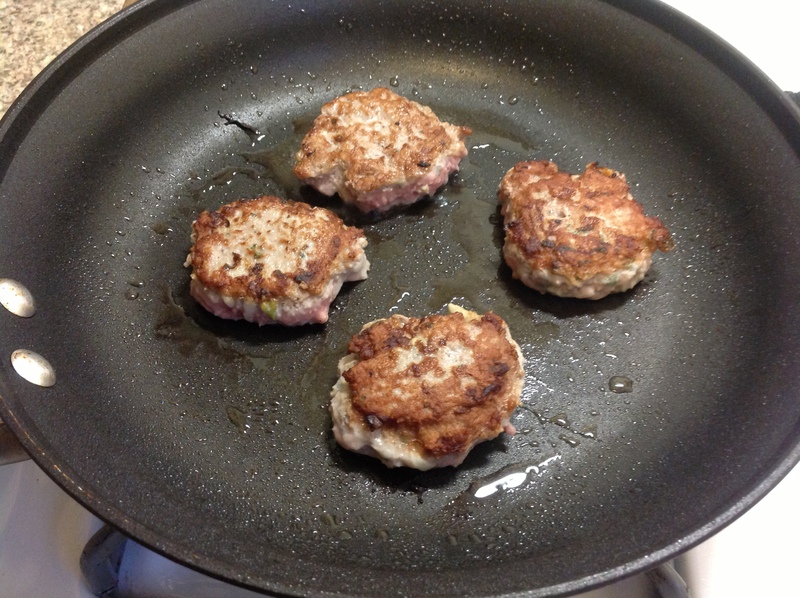 When the pan is hot, add a few patties, being careful not to crowd the pan. Allow to cook for about 5 minutes on one side or until you can see the bottom is browning and beginning to move up the sides slightly. 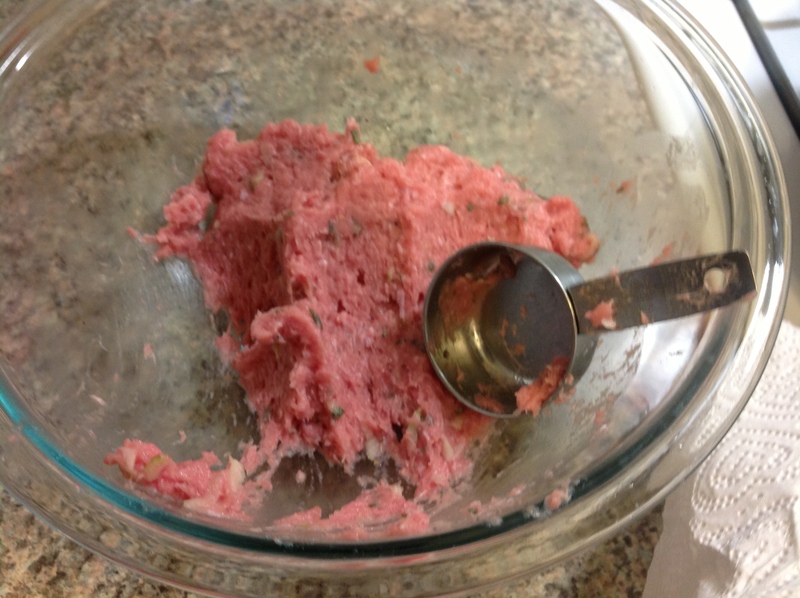 Gently flip and allow to cook until a thermometer registers 165 or until no longer pink in the middle. 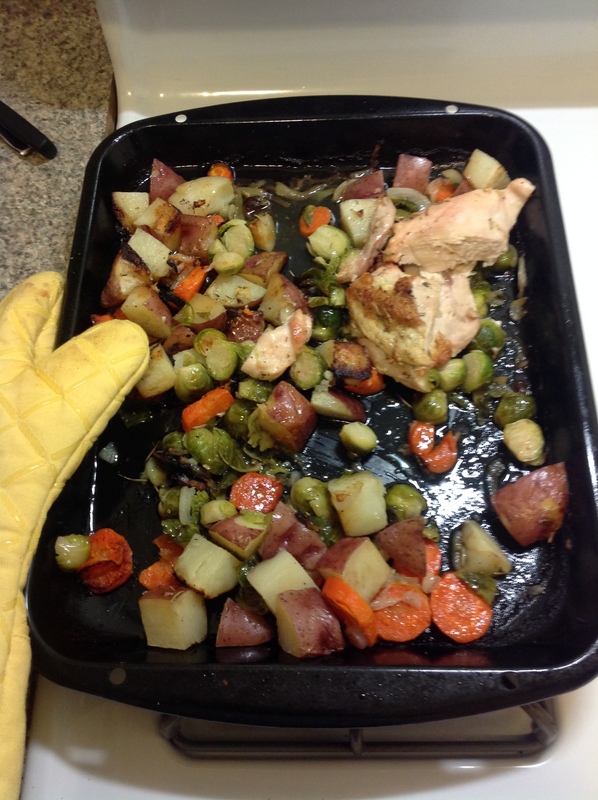 Remove to a cookie sheet or plate to cool and cook the next batch. These can be served immediately or frozen. 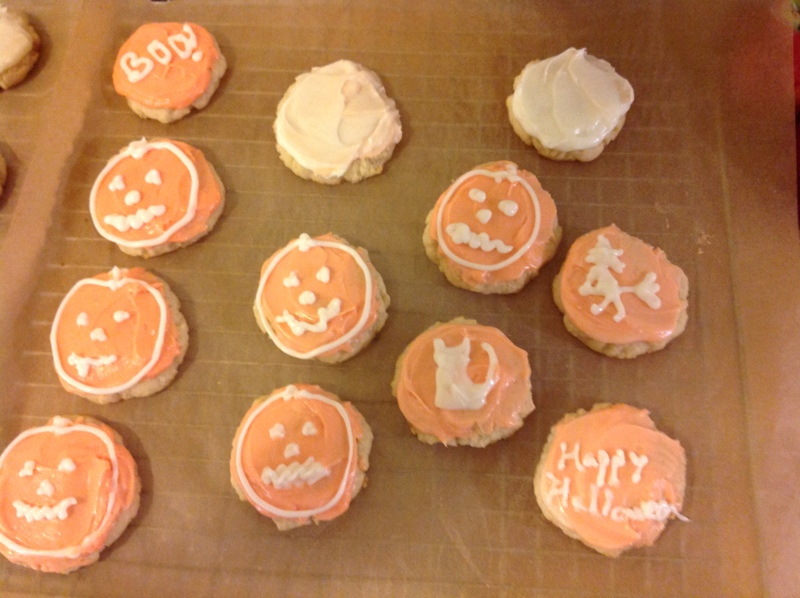 If frozen, lay them out without touching on a plate or cookie sheet. Put in the freezer for an hour or two until well chilled then move to a Ziploc freezer bag. This will keep the sausages from sticking together. To reheat individually, microwave on a microwave-safe plate for 1 minute (covering with a paper towel to prevent splatters) or reheat in the oven at a low temperature. I admit that I miss the warmth of the summer sun, but just the same I’m so glad it’s fall. 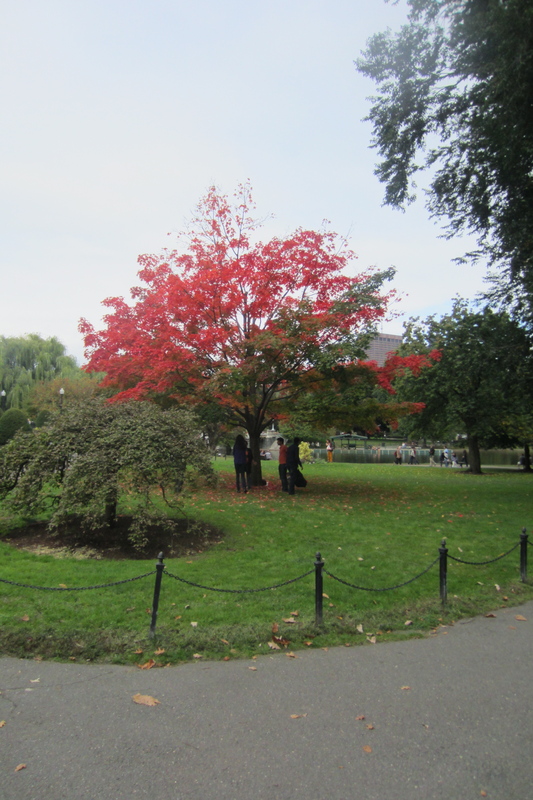 Bring on the red and orange hues that color the paths, the apples, pumpkins, and squash that warm our palates and tummies, and the-curl-up-under-a-blanket-with-a-good-book fall weather. Believe me, in a few months these temperatures we’re experiencing now will seem tropical. Enjoy it while it lasts.